Mix cream cheese product and Cool Whip until blended. 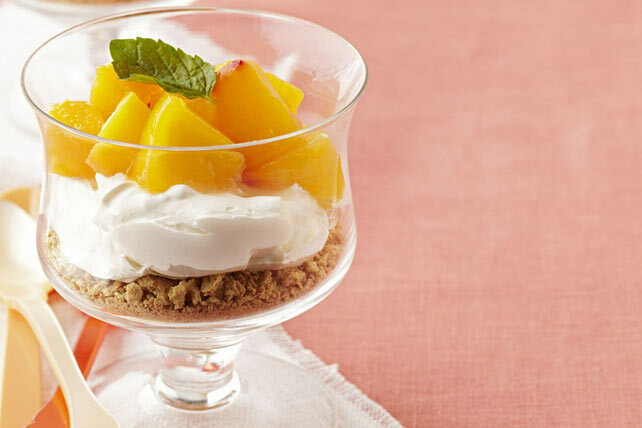 Spoon wafer crumbs into 4 parfait glasses; top with cream cheese mixture. Use back of spoon to press down centre of cream cheese mixture in each glass. Top with peaches and mint. Serve immediately. Be sure peaches are ripe. Bring a large pot of water to boil. Wash peaches, then use paring knife to make small cross-cut on bottom of each peach. Carefully add peaches to boiling water; cook about 45 sec. Remove from water with slotted spoon; plunge into bowl filled with ice cubes and cold water. Use a paring knife to peel the peaches, starting at bottom of each. If the peels don't come off easily, return peaches to boiling water for another 30 sec. to 1 min. or until peels can easily be removed. These creamy parfaits, made with better-for-you products, can be part of a healthy eating plan.